fixes brass letters to glass, with adhesive mastic preparation, or to other bases with screws, etc. general term applied to gas fitters, not water fitters, stove fitters or constructional iron fitters, etc., employed in building industry. 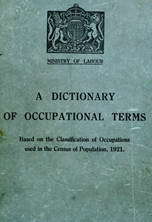 general term applied to carpenters, painters, bricklayers, masons, plasterers, and other skilled men in building trade, as distinguished from respective labourers. a steeplejack or a bricklayer (565) (q.v.) who builds chimney shafts of factories. cuts out two or three courses of bricks on one side of chimney shaft with a hammer and chisel; either pulls chimney down, on side thus weakened, by attaching cable to chimney and pulling thereon with winch or otherwise, or, puts wooden blocks into spaces from which bricks have been removed and sets blocks on fire; chimney falls when blocks are burnt out; work usually done by steeplejack (q.v.). fixes, with screws or nails, expanded metal, a perforated metal sheet used as key or bond to re-inforce concrete as base for plaster work; sometimes a carpenter (474) (q.v. ), or, in firms having much of this work, a specialist on this operation. fixes iron or steel rods used to re-inforce concrete, either by driving them into ground with a hammer, or, by fixing them into position with struts as erection proceeds, vertically or horizontally as required; bends rods in vice if necessary, fixes "cross ties," i.e., short rods at right angles to main rods, and secures them, where they cross, with pieces of wire; cuts rods with hack saw and twists wire with pliers as necessary. obtains smooth surface on floors, walls, etc., by running on moist cement, plaster, etc., and passing over it a float (special kind of wooden trowel). pulls down and removes buildings, using crowbar, hammer and pick. fixes up travelling cradles on the fronts, etc., of buildings for use by the steam brush cleaners, painters (592) (q.v. ), etc. applies a solution to the brick or stonework of the outside of a building to be cleaned, and whilst still wet, directs a jet of steam on it and scrubs with wire brush to clean off the dirt, etc. as for brass letter fixer (q.v.). builds or repairs steeples, chimney shafts, etc. ; erects his own staging, ladders, and scaffolding; usually able to perform work as bricklayer (565), carpenter and joiner (474), slater and tiler (570), plasterer (567), plumber (252), painter (592), gilder (485), electrician (307) (q.v.). constructs a thick roof covering of straw or rushes, by fastening combed bundles of straw or rushes to the roof laths with straw or rush rope; trims edges with special knife.